"CREATION OF THE CASCADE MOUNTAINS"
About one hundred to one hundred fifty miles east of where the Pacific Ocean pounds the edge of the North American continent, a 700-mile stretch of playground runs from southern British Columbia, the length of Washington state and Oregon, and into northern California. Known as the Cascade Mountain range, it is comprised of more than a dozen major peaks - many exceeding 10,000 feet in height - and many smaller mountains and buttes. Most of the volcanoes are extinct, but several -- most notoriously Mt. 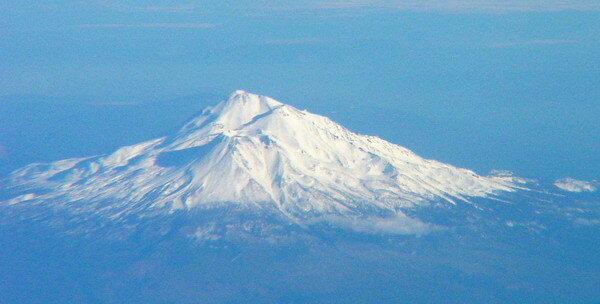 St. Helens -- are considered dormant. An endless procession of nature lovers and adventure seekers come to the Cascades to amuse and challenge themselves. Mountain climbers scale the peaks and ice climbers tackle frozen waterfalls. Off-road enthusiasts and mountain bikers weave their way through the forests to see how much dirt they can roost. Skiers ride the snow-covered slopes (year-round at Mt. Hood) while snowmobilers venture across frozen lakes. Hikers take on a maze of hiking trails, and campers pitch their home-away-from-home beneath towering stands of fir and ponderosa. Hundreds of miles of rivers and streams entice rafters, kayakers and canoeists. Fisherman bait numerous finned-and-gilled species and hunters search for elusive four-footed game. How did this wonderland of outdoor adventure come about? 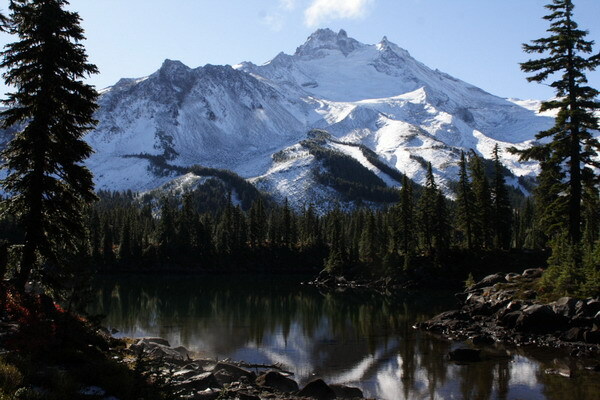 According to Native American legend, the Cascade Mountains were formed because of greed. Indians living in eastern Washington and Oregon beseeched Ocean to send his sons and daughters -- Clouds and Rain -- to bless their land. But no matter how much water was dropped onto the earth, the Indians wanted more. Clouds and Rain were away so long, Ocean became lonely and went looking for his children. When the Indians demanded that Clouds and Rain remain over their land, an angry Ocean pleaded with the Great Spirit to punish their avarice. In answer, Great Spirit scooped up massive handfuls of earth and formed a barrier between the dry country of the ungrateful Indians and the moisture-laden riches of Ocean. Thus came into being a magnificent chain of mountains whose names are whispered in the legends and memories of outdoor enthusiasts: Mt. Baker, Mt. Rainier, Mt. St. Helens, Mt. Adams, Mt. Hood, Mt. Jefferson, The Three Sisters, Mt. Bachelor, Newberry Crater, Crater Lake, Mt. 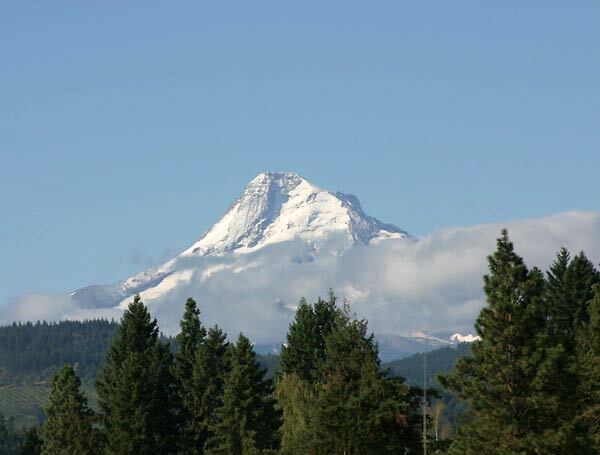 McLoughlin, Mt. 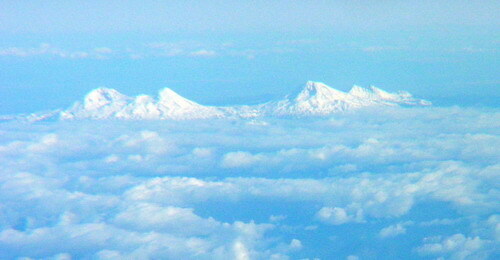 Shasta, and Lassen Peak. Geologists tell us the upheavals caused by the Pacific Ocean floor sliding beneath the North American plate off the coast of Oregon are responsible for the beauties studding the Pacific Northwest landscape. As the cold sea floor collides with the continental plate, it descends into the interior of the earth and heats up enough to melt the basalt rock of which it is comprised. If lighter and more fluid than the rocks around it, the molten basalt rises until it breaks through the surface of the earth and creates a volcano. Initial eruptions in the Pacific Northwest took place during the Eocene period, about 50 million years ago, and laid down a thick carpet of dark lava. Then things quieted down for a few million years. In the late Oligocene and early Miocene (about 30 and 20 million years ago), activity heated up again, and more lava spewed from the earths core. The last eruption epoch, which involved most of the Cascade chain, ended about 12 million years ago. There are three basic types of volcanic rock: basalt, andesite and rhyolite. A good portion of the magma which erupted from Cascade volcanoes has been basalt, but more of the rock is andesite and even rhyolite. Basalt is black, unless weathering or staining has altered it to a red or green, and arrives quietly in big flows of magma. Due to the calm manner of their eruptions, which tend to produce a symmetrical and low-lying cone, basalt volcanoes are called Shield volcanoes because their profile resembles a shield laying on the horizon. Over the eons, basalt magma built a continuous line of volcanoes atop a broad arch in the earth running the length of the Cascades. Many of these are massive, but in true shield volcano style, present a low profile. 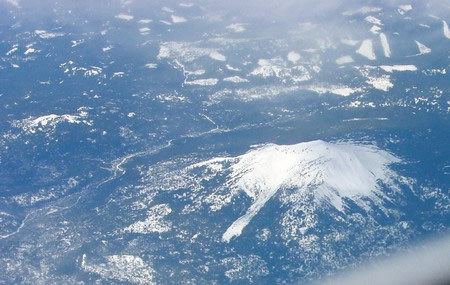 Belknap, located between Santiam and McKenzie Passes, is an example of a still-active basalt shield volcano. If molten basalt rising to the surface comes into contact with a mass of sediment with a lower melting point, they may combine and form granitic rock. As this mixture forces upward, some of it erupts and creates andesite volcanic matter, while the rest of the magma remains below the surface, slowly cooling into great portions of granite rock. When you come upon a large mass of granite, you have probably found the remains of a magma reservoir which once fueled a large volcano. Rhyolite is usually pale in color -- gray or yellow or pink. It is so thick that without an infusion of steam, it will break the surface in a mound known as a plug dome. If the lava is extremely dry, obsidian flows will result. Mt. Newberrys dry rhyolite eruptions, near Paulina in Central Oregon, created the largest obsidian flow in North America. If permeated with steam, rhyolite shoots out of the ground in masses of hot ash and can actually explode. If this steam boiler concoction is being held in place by a layer of rock, once it starts to erupt the entire chamber may blast forth, sending vaporized ash and shredded rhyolite pumice high into the atmosphere and across the surrounding countryside. If the volcano then collapses into the emptied magma chamber, a large is hole is left. When Mt. Mazama did this very thing 6,000 years ago, blowing a hole 15 miles across and 2,000 feet deep, Crater Lake filled the void. Mt. 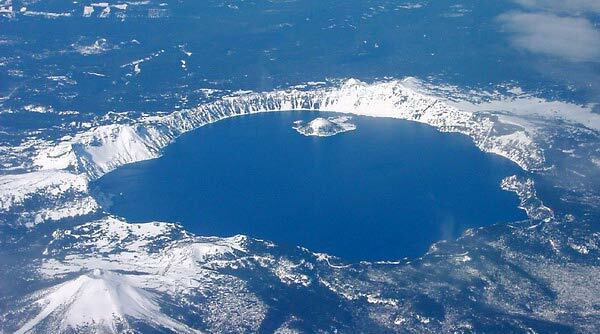 Newberys collapse formed a caldera which eventually became East Lake and Paulina Lake. Even today, hot springs in bubbling up in various locations of both lakes attest to the regions volcanic origin. Because the recorded history of volcanic activity in the Cascades only goes back less than two centuries, an active volcano may appear quiet for hundreds -- or thousands -- of years. Its appearance, though, can provide a good indication of its chances for future eruptions. If a large andesite volcano is smooth, showing few signs of erosion by glaciers or streams, it can probably be regarded as active. On the other hand, a distinctly eroded mountain has not camouflaged the wounds inflicted by the last ice age, which ended about 10,000 years ago, and is probably extinct. Near Klamath Falls, Mt. McLoughlins smooth, conical shape is a good illustration of a volcano that renewed the symmetry of her lines with lava flows. Three Fingered Jack and Diamond Peak, on the other hand, still show the deep scars of glacial activity. A volcanos style of eruption changes as it progresses from oozing dark basalt to producing andesite and on to disgorging rhyolite. 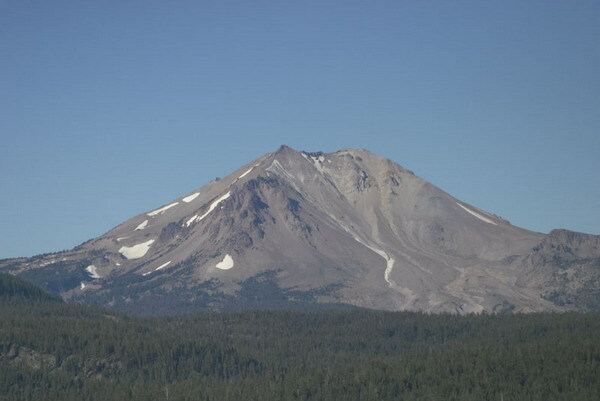 From the Three Sisters south, several Cascade volcanoes have begun producing light-colored rock, even occasionally rhyolite. None of the large volcanoes north of this area have yet gone beyond andesite. Native American myth tells us the Three Sisters, known as Klah Klahnee (Three Points), was once the largest and tallest of the Cascade mountains. Then the earth shook for days and the mountain boiled inside until fiery rocks came seething forth. Flame and smoke rose high into the air, tossing red-hot stones in all directions. When quiet finally descended again, most of the mountain was gone, leaving only the three points we see now. Sometimes myth accurately describes what probably happened. Thank the Great Spirit for interceding between Ocean and the greedy Indians, or the collision of sea floor and land plates which send streams of magma bursting through the earths crust. Whether you stand in awe watching pictures of the 1980 Mt. 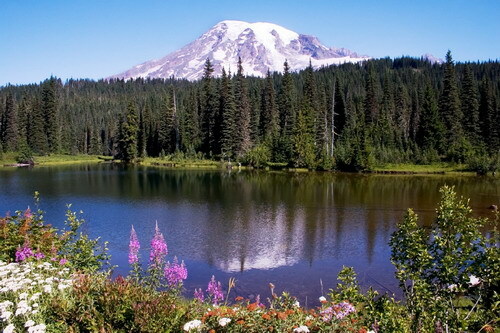 St. Helens eruption, climb to the peaks of these mountains, or play on their glaciated, forested and stream-fed flanks, you can be grateful for the grandeur and recreational opportunities the Cascades provide. Vicki Andersen may be reached at: skicat1@comcast.net.